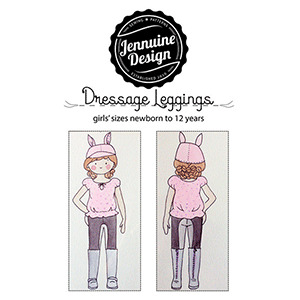 Dressage Leggings are a true close-fitting legging with inset panels in front and rear to mimic riding pants with a saddle grip. Perfect for highlighting interesting fabric combinations or to preserve lighter colors with a darker seat panel. 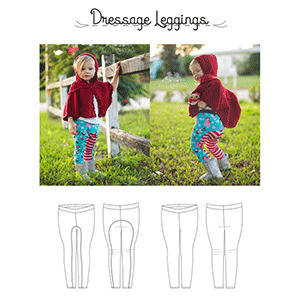 Basic pattern pieces are also included for a fast sew version. This pattern is available in sizes newborn to 12. Suggested fabrics are cotton jersey, cotton lycra, lycra spandex, scuba knit, ponte de roma, or stretch vegan leather.